Create and edit subtitle files fast and easily, supports over 30 subtitle formats and any video type including AVI, MPEG, WMV, etc. ALLPlayer is known Multimedia Player among non-English users that tent to download right subtitles in an Instant Mode. The new Player brings many enhancement against former version. Create and edit MicroDVD subtitle files fast and easily. Supports any video type allowed by Windows Media Player. 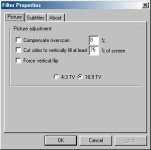 Similar to SubAdjust, but for the MicroDVD subtitle format - splits subtitles into segments for multiple CD-R DivX movies. Sublight allows you to search and download movie subtitles.